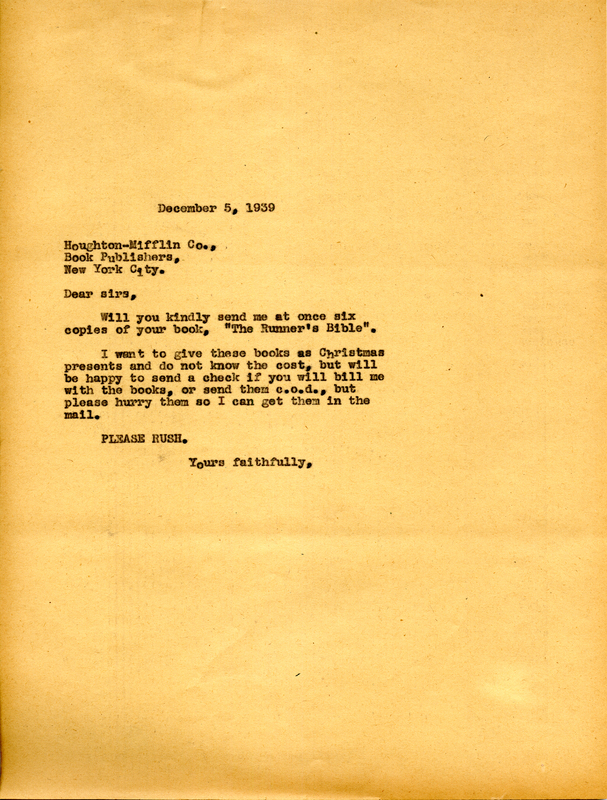 A letter to a publishing company from Miss Martha Berry requesting six copies of the book, "The Runner's Bible" with hopes of a speedy delivery so she might get it in the mail and delivered before Christmas. Miss Martha Berry, “Letter to Houghton-Mifflin Co from Miss Martha Berry.” Martha Berry Digital Archive. Eds. Schlitz, Stephanie A., Jessica Hornbuckle, Camille Hanner, et al. Mount Berry: Berry College, 2016. accessed April 20, 2019, https://mbda.berry.edu/items/show/15268.